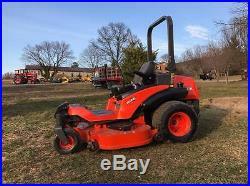 KUBOTA ZD331 DIESEL 31 H. P COMMERCIAL PROFESSIONAL LAWN MOWER PRO COMMERCIAL 72 INC DECK. TAKE A MOMENT AND WATCH THE VIDEO OF THIS MACHINE. 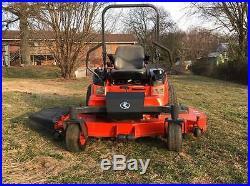 SUPER LOW HOUR READING 157 THIS MOWER IS NOT EVEN BROKEN IN YET LOOK AT THE SIDES OF THE DECK TEY ARE NOT EVEN SCARRED UP THIS MACHINE IS IMPECCABLE. CALL 301 800 5600 ANYTIME WITH QUESTIONS. WE WILL ASSIST YOU IN ARRRANGING FAST SHIPPNG. FEEL FREE TO COME BY AND TEST DRIVE IT. 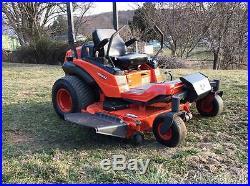 THIS MOWER IS SUPER FAST AND SUPER POWERFUL. 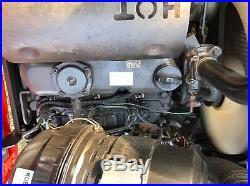 3 CYLINDER DIESEL ENGINE. 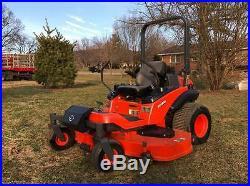 31 HP KUBOTA DIESEL. RUNS AND OPERATES GREAT. ALSO FOR SALE LOCALLY. Day in and day out, you need a professional turf mower that handles non-stop use – a mower that’s maneuverable, cost effective, and loaded with the features to make your job easier. That’s why Kubota developed the ZD-300 series zero-turn commercial mowers – to deliver the results your business demands. The ZD-300 series offers a state-of-the-art Kubota diesel engine, a high-capacity HST transmission, a deep mower deck, and an ultra-comfortable operating area. In short, the ZD-300 series delivers. 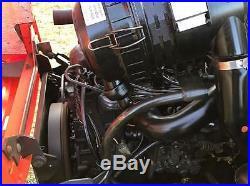 Engine: Kubota D1305 3 Cylinder Diesel. Displacement: 76.98 cu. Wheel Base: 60 Inch. 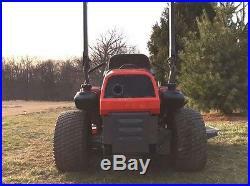 Weight: Between 1773 lbs & 1812 lbs depending on mower. Travel Speed – High: 10.6 mph. 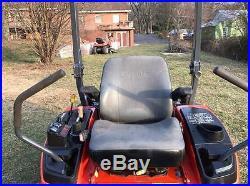 MOWER IS FOR SALE LOCALLY ALSO. COME BY HERE AND RUN IT FOR YOURSELF. CALL 301 800 5600 ANYTIME WITH ANY QUESTIONS DAY OR NIGHT WEEKENDS TOO. PLEASE FEEL FREE TO COME AND INSPECT AND TEST ANY EQUIPMENT WE OFFER IF POSSIBLE, WE WOULD RATHER YOU MAKE AN INFORMED DECISION. WE ENCOURAGE AND WILL HELP FACILITATE THIRD PARTY INSPECTION. WE ARE A FAMILY BUSINESS THAT STARTED ON A FAMILY FARM THAT HAS EXPANDED DRAMATICALLY OVER THE YEARS. WE NOW OFFER MILLIONS OF DOLLARS WORTH OF EQUIPMENT WITH NEW ITEMS DAILY AT OUR MANY LOCATIONS. IT IS OUR DESIRE TO HAVE OUR CUSTOMERS FOR A LIFETIME WITH ANY OF THEIR EQUIPMENT NEEDS. YOU ARE WELCOME TO LEAVE YOUR ITEMS ON OUR PREMISES FOR 60 DAYS FREE OF CHARGE. ALL INFORMATION IS NOT GUARANTEED AND SHOULD NOT BE RELIED UPON. IF NOT PAID FOR IN 48 HOURS RESERVE ALL LEGAL RIGHTS. THERE ARE NO EXCEPTIONS. ALL SALES ARE FINAL. WE DO NOT DESCRIBE ANY MACHINE FOR ANY PURPOSE OR CONDITION, SAFETY OR OPERATING CONDITION. WE DO NOT WARRANT ANY MACHINES APPLICATION FOR ANY SPECIFIC PURPOSE, ANY AND ALL DESCRIPTIONS OF ANY EQUIPMENT MAY BE TAKEN FROM OTHERS AND CAN NOT BE DEEMED RELIABLE BY OUR COMPANY OUR OTHERS. ALL SALES ARE FINAL FOR EITHER A CONSUMER OR BUSINESS. WE ARE A B2B BUSINESS THAT TRADES BUSINESS TO BUSINESS. The item “KUBOTA ZD331 ZD 331 MOWER ZERO TURN BOB CAT TRACTOR DIESEL RIDE ON COMMERCIAL 72″ is in sale since Saturday, February 18, 2017. 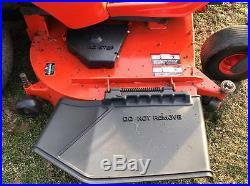 This item is in the category “Business & Industrial\Heavy Equipment Attachments\Mowers & Mower Conditioners”. 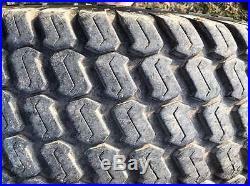 The seller is “tamassetauctions” and is located in Boonsboro, Maryland. This item can be shipped to United States. 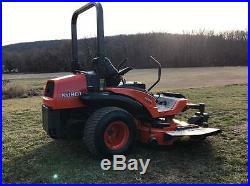 This entry was posted in kubota and tagged commercial, diesel, kubota, mower, ride, tractor, turn, zd331, zero. Bookmark the permalink.